The GTB Fire Rescue is recruiting paid on-call firefighters! We will provide you with the Fire and EMS training needed. 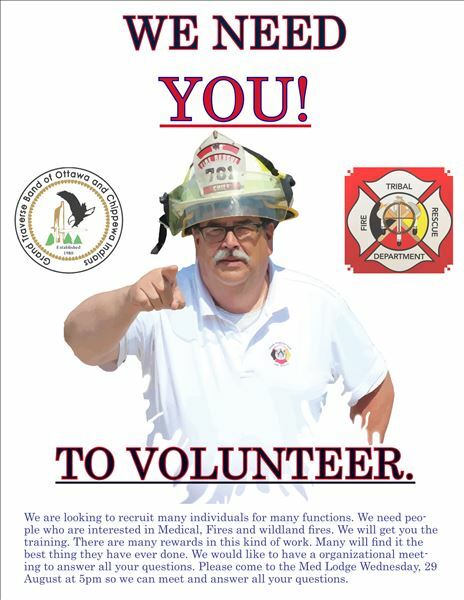 The GTB Fire Rescue is also recruiting for a team wildland firefighters. Wildland fire teams have the opportunity and chance to be deployed around the country. The GTB Fire Rescue Department welcomes new members to join the department. Contact GTB Fire Chief Stephen Moldenhauer at (231) 534-7666 or (231) 534-7161 or by email: Stephen.Moldenhauer@gtbindians.com for additional information.